Wow! Super cute house with tons of character. 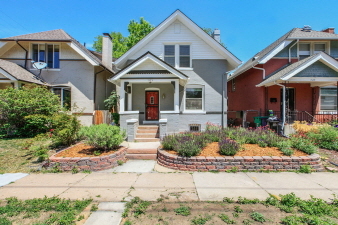 Minutes from City Park, Zoo, downtown, RiNo. Professionally landscaped. New paint in/out. Brand new carpet and kitchen floor. Seller providing allowance of $4K for wood flooring. Wood bid attached for new flooring as seller didn't want to choose wood or carpet for new owner. Basement is large, includes workbench, laundry, and served as jeweler work space for prior occupant. Hot water heater replaced 2016. Very private yard with firepit, patio, gardening area, and shed. Always lots of parking.